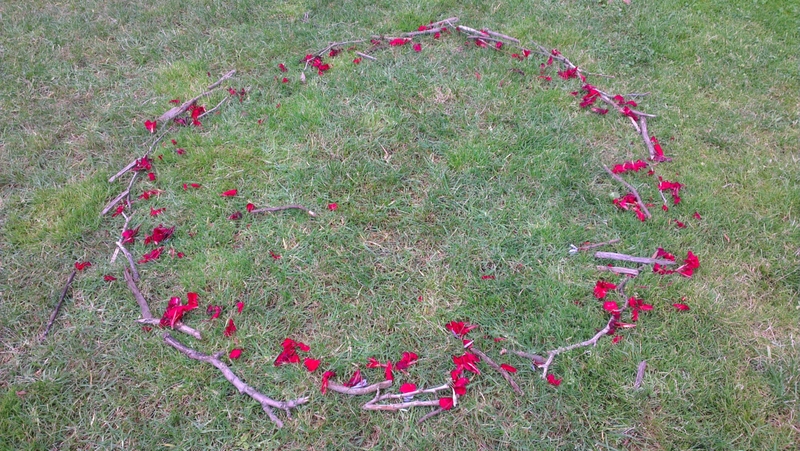 I found this beautiful circle in the gardens on my way to work. I talk to strangers now. Not out of any sense of duty or obligation but because I appreciate our shared humanity. The universe in me recognises the universe in you. I acknowledge our beauty. It extends to the more than human also, to the trees, birds and other creatures that cross my path. All these little interactions matter now. Having shared Eisenstein’s vision through his writing, I can see that each of these little moments, even if they never emerge from the cloud of ponderings within my own skull, are important. Each moment is contributing to the creation of the more beautiful world our hearts know is possible. I pass over the great Birrarung/ Yarra River, twice a day and the view never fails to move me. Since reading this book I’ve begun to pay attention to my fellow passengers in the moments after crossing the river. I have noticed that I am never alone. There is always someone else paying attention to the beauty of the river, just like me. You are living in a new story, and it feels maybe a little tender or fragile, and you want support and a frame of reference to help navigate its challenges. I think I’m somewhere between the second and the third category, depending on the day and the people who are around me at any given moment. It’s been a long slow transition over a couple of years now, sometimes it feels incredibly fast and sometimes painfully slow. Mostly I am grateful for the pace, it has allowed me to slowly transform each part of my life in turn yet been overwhelming enough to force me to surrender! Let me know if you’re interested in coming on the journey, perhaps if there’s a bunch of Melbourne folk who are doing the course we could all meet up at some point. I have discovered this week that there are people reading this blog that I had no prior awareness of, it’s kind of thrilling and makes me really curious to know who’s out there. Martin didn’t always love plants but he’d always been awkward. A slightly withdrawn child, in his own world, “Off with the fairies” his dad used to say. The words made him shrink a little as he slunk off into the garden. He would have liked to be surrounded by friends but somehow, couldn’t manage it. Other children looked sideways at his quirkiness, it interrupted the flow of the ordinary. They didn’t quite understand what he was saying but felt shown up by it anyway. They covered their confusion by giggling behind their hands at him. He, feeling hurt, retreated further into his flights of fancy. The trees were what brought him out. At first they were merely a backdrop, characters invested with his imaginings. Then, as he began to whisper his secrets to them, they became his friends. Finally, as the self obsession of adolescence gave way to a mature interest in the world, he found that trees have secrets of their own. He developed an eye for green and growing things, noticed them everywhere and delighted in their determination. Moss-lined gutters, weeds poking up through cracks in the footpath, an impromptu garden in a long forgotten laneway. He was inspired by things that grew in adverse conditions. For a time he buried the quirky, imaginative child under the weight of scientific enquiry. He dressed in brown and beige, wore his glasses high on his wide nose and focused on his studies. He never stopped speaking to the trees, though if you asked him he would have said he was speaking to himself. It became his habit to walk each day by the river at Burnley and it was there he attracted the attention of a particularly ancient tree. The tree was fond of the way Martin addressed her and her colleagues as so few humans do. She could feel the respect and admiration Martin directed toward them, and the tree, very slowly in the way of old trees, made up her mind to reward him. So it was that one day Martin, frustrated at a failed experiment wished aloud that he could make things grow. The tree sighed with delight and Martin turned to see who interrupted his solitude. There was no one there but Martin found himself overcome with dizziness. He sat abruptly as the whirling passed from his head and his whole body began to shiver uncontrollably. When the seizure passed, Martin sat up, gazing blearily at the world. It was then he noticed his hands. Gasping in amazement he held them up to face. They were quite green. He pulled up his jumper to find that it wasn’t just his hands, his whole body was green. He thought it must be some kind of sick joke. For several minutes he stared up at the sky wondering about dye falling from above. The sky was empty as was the park around him. Shaking his head in bewilderment, Martin headed home. In his small bedsit he headed for the shower. The green wouldn’t budge. No matter how hard he scrubbed, the water ran clear and his skin remained resolutely green. Martin felt sick, drying himself off, he headed for the kitchen. He busied himself, making a cup of tea, still shaking his head with disbelief, too preoccupied to notice the tiny buds of green popping out of the floorboards. It was the tea leaves that alerted him to his new power. As the teapot steeped he brushed stray leaves off the bench into his hand. He turned to the sink to let them go only to find a handful of green leaves in their place. Martin shook his head, seeing but unable, unwilling to comprehend. He stood at the sink transfixed, staring at his palm in disbelief. The tea leaves continued to unfurl, gently tickling his palm as they came to life. A movment at the edge of his vision drew his attention to the floor. He could see, precisely the path he had taken from bathroom to kitchen bench. Each footprint was now neatly outlined in bark, small shoots sprang forth and were just beginning to bud into leaves. Martin quickly turned back to the teapot, letting the handful of leaves drop to the floor. Carefully placing the strainer, he took refuge in the ordinary ritual of pouring. Time slowed as he narrowed his attention to sugar and spoon, losing himself in the whirl of brown as he stirred. He resolved to finish his tea and take himself to bed, hoping that sleep would erase the insanity his senses were delivering to him. Sleep came quickly but provided little relief. He dreamed of vines that reached for him, chasing him through the bush. He hurled himself at last against the trunk of a tree, climbing upward only to find himself sinking into woody fleshy. He struggled to free himself, shaking his arms but as they swayed, rustling the leaves over his head, he realised it was too late. The only trace of the man he had been were the glasses embedded in his trunk. He was woken by music. Instinctively rubbing his eyes, he was relieved to discover he could move. He rolled out of bed and went in search of the melody’s source. It was not a sound that was captured by his ears so much as his heart, awakening a curious longing within him. As he entered the kitchen the music changed, brightened and he was arrested by the sight of the flower pot on the window sill. The flowers didn’t exactly turn to face him but with a warm thrill, he could feel their regard. The song of welcome and gratitude emanating from the plant was the most beautiful thing Martin had ever heard in his life. In that moment he forgot his troubles. He reached for the flower pot and, cradling it in his arms, he sat on the floor and wept. Martin felt overwhelmed by the pull of belonging. Looking around the kitchen he took note of saplings, rooted in the floorboards and now reaching toward the ceiling. He found he could feel them too, yearning for life, for sunlight and rain. He threw open the curtains and turned on the taps, filling an empty bowl he slowly, reverently began to water the small trees. Their response was swift and joyful, Martin’s face was wet with tears as he surrendered to the beauty of their music. *This story was inspired by Gary Hirsch’s workshop ‘Making art and giving it away.’ Read about my initial experience here.